Online side hustles are great. As extra income generators, they can pay down debt, boost savings, or even make ends meet between paychecks. But side hustles and online extra money makers are just that — ways to make a little cash here and there, not income you should count on. And for some people this kind of work is the perfect way to make a buck or two on the side. But for others, it’s simply not enough. Instead, a real work from home career is required, you know, one that can pay the bills each month and is benefits eligible. If you thought working from home or online was only good for beer money and rainy-day funds, think again. Today, many companies routinely hire career-seeking employees to work from home giving workers around the world an opportunity to build a career while working remotely. Digital Nomads. Distributed Workforces. Telecommuting. Buzz Terms or Something More? Whether you want to learn more or are convinced working from home is where it’s at, there are definitely some notable benefits. What’s your current commute? It takes the average U.S. worker 25.4 minutes to get to work. That’s a total of more than 50 minutes each day. Let’s assume you go to work five days a week for 50 weeks out of the year — that’s a whopping 12,700 minutes spent in your car annually to get to and from work! Granted, your commute may be shorter or longer (hopefully not the latter). Either way, we’re talking about some serious time logged behind the wheel each and every workday. When you work remotely, your commute is almost non-existent. For me, it’s a seven-second walk down the hallway and a quick right. Most mornings I also have to contend with a persnickety gray cat sleeping in my office chair but, still, all in, I’m looking at less than a minute before I’m in said office chair and checking things off my to-do list. And while most people think of the morning commute — don’t forget about evenings too! After a long day of work wouldn’t you much rather shut down your laptop and head straight to the kitchen instead of your car for rush hour traffic? Working from home is a money-saver. Big time. For starters, you don’t have to worry about filling up your tank to get to work. There are rarely expensive lunches eaten out. And you don’t have to dress to impress (most days) which means your work wardrobe budget isn’t sky high. Bear in mind, my car is older and paid for so that makes my insurance much cheaper too but, in total, I pay less than $30 a month — working from home certainly helped slash my yearly insurance premium. My favorite benefit of working from home is happiness, but you probably already knew that. I’m not alone. A recent study found that not only are remote workers more productive, they’re happier. And who couldn’t use an extra dose of happiness in their life? For me, the happiness stems from working where I feel most comfortable. But for others, a remote work environment might mean they get to help get their kids off to school in the morning and be home when they return. For those with a disability it means having accommodations in place that allow them to work independently. Really, it can mean a lot of different things to different people. What will your work from home happiness be? Now, it’s also worth noting, there are some drawbacks to home-based employment. For starters, there can be a disconnect between you and your in-office coworkers. When there’s no watercooler to gather around or impromptu lunch outings and after-work happy hour, you miss out on some bonding time. If you’re a social butterfly and count your coworkers as some of your best friends, a home office environment may leave you feeling lonely and unfulfilled. What Kind of Careers Are Out There? If you’re convinced you want to give remote work a try, you’re probably wondering what career options are out there. Really, just about any job you could do in an office can also be done in a home office. That’s why more and more companies are embracing remote workforces. But if your current company doesn’t allow remote work, you’ll need to find some place that does. You don’t have to look too far for home-based employment — some of your favorite companies are remote-friendly. Through the Apple At Home Advisor Program, you can join one of the largest tech companies as a remote employee. Available positions include tech support, customer service, and chat agent. The Disney Store’s ecommerce shop hires home-based employees to assist online shoppers with orders, returns, and any questions they may have. Since they’re not always hiring, you’ll need to search their careers page for online guest representative. At American Express cardholders get a lot of perks — and the same can be said for their home-based employees who receive great benefits and competitive pay. Home-based travel jobs and customer service positions can be found on their hiring page. The best way to get in at Amazon is during the busy holiday season but remote customer service positions can be found here year round. Head over to their careers page to see what is available at any given time. There are several opportunities to join U-Haul — Roadside Assistance Agent, Reservations Representative, and Customer Service gigs can all be found here. Visit their home-based hiring page to learn more about each opportunity. Of course, this is just a short list of some of the well-known businesses with work-from-home positions. Many brands opt to outsource their home-based jobs to larger companies who handle hiring. For example, Vimeo uses the Yeomen for their support and customer service. And popular brands like Bluefly and Skullcandy turn to VIPdesk Connect for help hiring agents to assist their customers. A distributed workforce is one where employees work virtually and from just about any location. This means the Marketing Director may check in from his or her home office in Seattle while the Human Resources Manager prefers a coworking space in Boston — really, these workforces are unique in that the majority, if not all employees, work from the location that makes the most sense for them. Join the ranks of 20,000+ subscribers and receive biweekly tips and remote job leads from Remotive. You can also stop by their job board any time to see who is hiring — a variety of jobs from amazing companies like Zapier and Ghost can be found here. You know how I said many startups are embracing distributed workforces? Well, AngelList is the perfect place to find them — there are more than 21,000 startups hiring on AngelList, many of which have telecommute positions available. You’ll have to create a profile to browse jobs and apply to listing (it’s free), but once you do, you can easily apply to multiple jobs by using your existing profile. Are you on LinkedIn? As a freelancer, it’s a great way to connect with clients but it’s equally valuable for career-seekers on the hunt for remote work. You can let recruiters know you’re open to new job prospects and proactively search for positions. I frequently see telecommute positions here that aren’t widely advertised elsewhere! Granted, some listings may be freelance, contract or extra income gigs but many others will be for a variety of legitimate home-based career opportunities. If you’re not using Indeed on a daily basis, you’re seriously missing out. 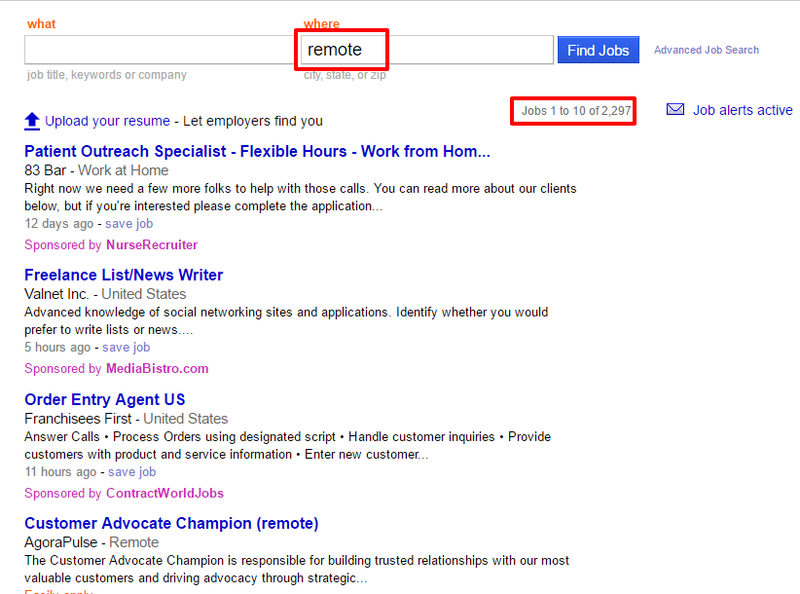 Give it a try, type remote in the “where” box below and start browsing (and applying) to remote positions today. While Remotive, AngelList, LinkedIn and Indeed are great places to find a ton of work in one spot, they don’t have any and every available home-based career position out there. In fact, many companies with remote opportunities prefer to list openings directly on their hiring or career pages. For example, Buffer, Upworthy and Meet Edgar are regularly-hiring remote companies that post available careers directly on their websites. So, how do know which companies’ career pages are worth a look for remote jobs? Fortunately, there’s a super-useful public Google Docs that keeps a running list of startups and companies with distributed workforces. It may take some time, but it’s definitely worth browsing through and scouting out career pages that look promising for the type of work you’re seeking. Now that you know what’s so great about working from home, companies with remote teams, and where to look for jobs on your own — what are you waiting for? Take the time to brush up your cover letter and make your resume remote-friendly. And then start applying! Feeling stuck in your remote job search? Need some advice? Have a question? Please, leave it in the comments section below, I’m always happy to help. 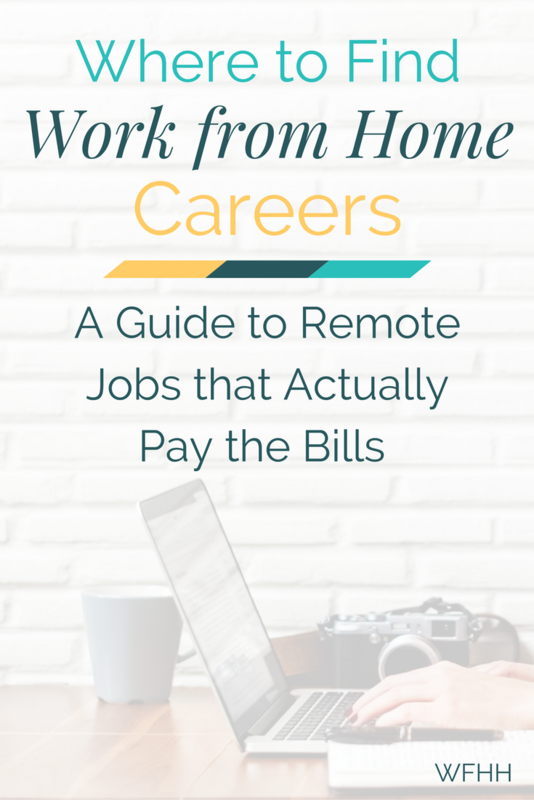 The post Where to Find Real Remote Jobs that Actually Pay the Bills appeared first on Work from Home Happiness.